Houston airbrush makeup artist, Keri Ann Readon, blogs about makeup tips here, but also hopes to provide clients with resources to help them plan and prepare "for all of life's special events". 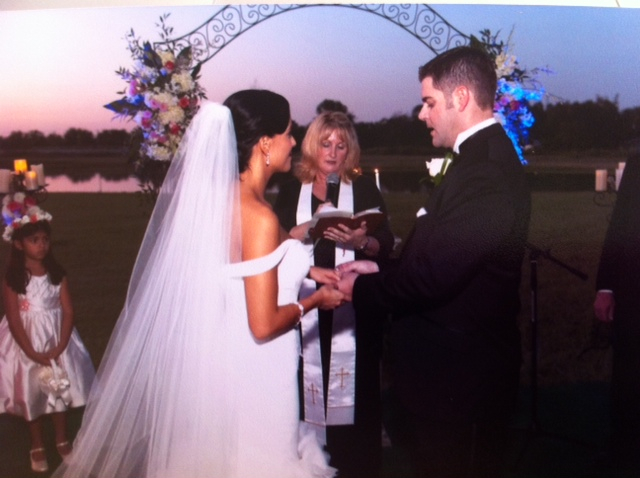 Today's guest blog post is written by Wedding Chaplain Tara Dorroh from Going to the Chaplain. These are just a few questions brides and grooms may have before hiring a wedding officiant. Q: We aren't religious or we are from different religions and we just want someone to marry us. Is a chaplain right for us? A: Yes! A chaplain is trained to meet people where they are spiritually without ignoring their own convictions. Q: When in the planning process do we need to secure the officiant? A: I think most people think this is something you can put off until the last minute. Not true! A minister's calendar fills up just like a florist or cake bakery. Book early, at least 6 months but preferably a year in advance. Plus it gives the clergy more time to get to know you through emails and touching base now and then until the wedding day. Q: Where is the most ideal spot for a wedding ceremony? A: Depends on the geographical location. I have never understood Texas brides that want to get married outside in Texas in the summer! Be mindful of your make up and photos and what the temperatures will be where you will have the wedding. Just like you wouldn't have an outdoor wedding in the winter in Michigan, don't have an outdoor wedding in a windy city or in Florida during peak hurricane season. You will be happier in the long run to think it through. Q: We are living together, so we don't need premarital counseling, do we? A: That's fine, but at least one consultation should be required by the minister. You may not need several counseling sessions, but for the minister/clergy/chaplain to get a sense of who the bride and groom are, at least one sensible consultation in advance of the rehearsal should be expected. Q: How much time is our officiant going to need? A: The actual ceremony is the shortest but must important part of your day! I have done ceremonies as short as 10 minutes and as long as 30. It SHOULD depend on what YOU, the couple wants. If a minister wants to control the amount of time the ceremony is to be, you might want to choose another minister that will bend to your wishes. Q: Is it customary to tip the officiant? A: If you are having a minister from your personal church and they don't charge a fee, then, yes, you should, according to the time and effort and input they have given you before they see you at the altar. If you choose a minister/clergy that already charges a fee, then no. Although if you pay their fee and you think you would like to give them something extra for a job well done, that is always appreciated. Q: What are some funny stories from your side of the wedding? A: Well, I have had to stop the wedding ceremony because the best man left the bride and groom rings in his car! I made light of it, we all had a good laugh and I reminded the couple, this is the thing you can laugh about later, and if this is the worst thing in your marriage you are blessed! Another time, the groom actually said his name wrong! Again, I said something like---"Yes, that name will work too.."--gave everyone a laugh and gave the groom a much needed bit of comic relief! I hope that you will choose your minister with as much thought and care as you do the other areas of your wedding planning. After all, the most important job belongs to the one that God has given the authority to join you as husband and wife. To further assist a bride and groom in their search for a wedding officiant, I have created a list of questions for them to listen for. Please click here to see those questions.